To come face to face with one of the most awe-inspiring predators on the planet is truly one of the greatest adrenalin packed photography experiences you can undertake. Lake Clarke National Park gives you a true sense of the Alaskan wilderness, with towering volcanic mountains forming an immediate backdrop to the tidal marshes, streams and pristine salt-water bays which comprise the coastline and is one of the premier Grizzly bear viewing areas in the world. We have timed our trip to coincide with the Salmon migration through the estuaries and creeks which attracts this beautiful Bear to these coastal regions. 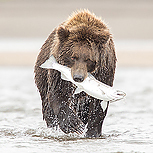 We will go out looking for fishing bears each day under the expert guidance of some of the best guides in Alaska and the photographic opportunities will be endless. To photograph Grizzly Bears in some of the most beautiful surroundings is one of the most rewarding experiences a wildlife photographer can possibly do. Day 1: We are due to arrive in at Anchorage Airport from our chosen connecting flights. We will then transfer to our accommodation which is a local hotel in Anchorage. Day 2: After an early breakfast we then make our way to Lake Hood to catch our special small bush plane. The flight to Lake Clark is an adventure in its self and we will be passing by some wonderful scenery and flying over Cook Inlet. Once we have landed at Silver Salmon Creek we are greeted by our hosts and guides. We then transfer to our comfortable and homely lodge. After lunch we will then head out on to the sand flats to look for bears. Day 3: The whole trip is dedicated to photographing bears and because of the nature of Silver Salmon Creek, we are a small group in a huge wilderness. This really is a special experience to be in the Alaskan wilderness to witness one of the greatest shows on earth. During the early part of September the Salmon start to undergo their long migration back to their spawning grounds. The grizzly bear is waiting for this moment and as the fish try to swim through the shallow waters of the estuary towards the streams and creeks the bears start chasing them through the water. 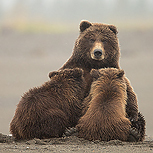 We will be trying to photograph the spectacle along with mothers with young cubs, bears resting and young cubs play fighting. If we are lucky then bears fighting over fish are also a possibility. The location is stunning with vast landscapes which will be great at capturing the bears in their environment. The salmon run during an incoming tide and the best activity for the bears is during this period so we’re governed by the tides but the lodge is very flexible and we can work around this. Days 4-8: The whole trip will be of the same pattern of the first day. We might encounter bears just outside the lodge or it might mean a longish drive by our ATV and even a bit of a walk to a favoured hunting spot. Walks will be over a short distance so no big hikes are involved during this trip. The bears at Silver Salmon Creek are only here for the Salmon and so are people neutral. The bears know we are there and don’t see us as a threat. Our guides have years of experience and know what distances we can approach certain individuals. They also have expert knowledge of the terrain and have an amazing ability to predict the Bears next movements which is perfect for us as photographers. Day 9: We should have one more session with the bears before we catch our Bush plane back to Anchorage where we will be based for our final night. Day 10: After breakfast we are due back to Anchorage Airport to catch our return flights back to our chosen destination. Please not that for European destinations this will involve an overnight flight so we won’t return back to Europe until the 11th September. “The guides from the lodge were extremely helpful and friendly”. Accommodation, Special float plane from Anchorage to Lake Clark National Park, all meals, and local guides for the fishing bears. International flights, alcohol, local guide gratuities which is around 15 Dollars per day and sundry items. Accommodation is based on a twin room basis dependent on which hotel/lodge we are at during our travels. In Anchorage it will be typically comfortable US motel-style accommodation. At Lake Clark it is a wonderful lodge set in beautiful surroundings. The weather can be unpredictable in Alaska at this time of the year so suitable clothing/footwear is necessary. Walks out to the estuary looking for the bears can be for long periods in duration but not in distance as the walking in very minimal as we use ATV’s.